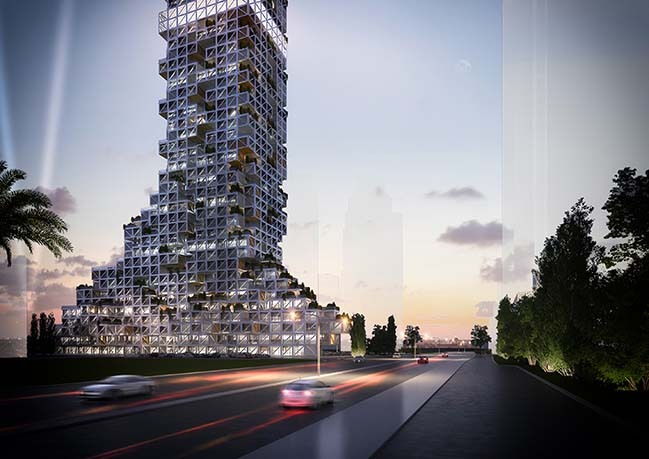 Ankara-based architecture firm rgg Architects will design its first mixed-use structure in Marina’s region of Dubai. Located at the center of the district's bussiness hub and high-rise office towers, the Dubai Nhabitat tower is conceptualized with an architectural approach that permits as transparent, perceivable and pluralistic uses as possible. From the architect: Dubai Nhabitat is located in the Marina District of Dubai behind other business centers and high-rise office towers, competing with their heights in the world, lined along the shoreline. 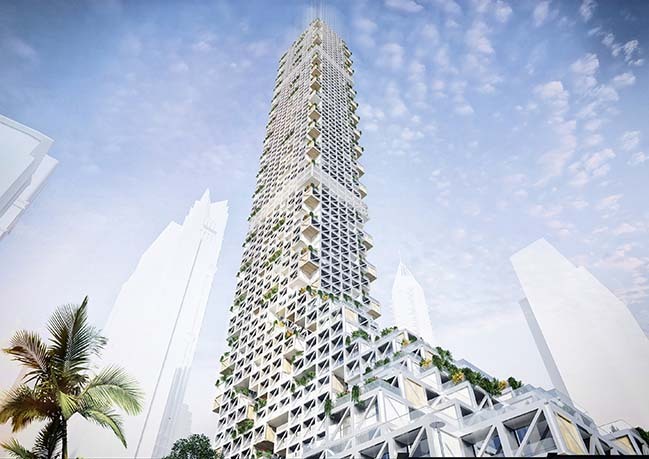 The mixed-use tower, which reaches 310 meters in total with the height above the ground, directs its facade to the Sheikh Ziyad road on the front of the project plot, while it provides the control of the pedestrian and vehicle network with the connection to the subway station located at the ground level. 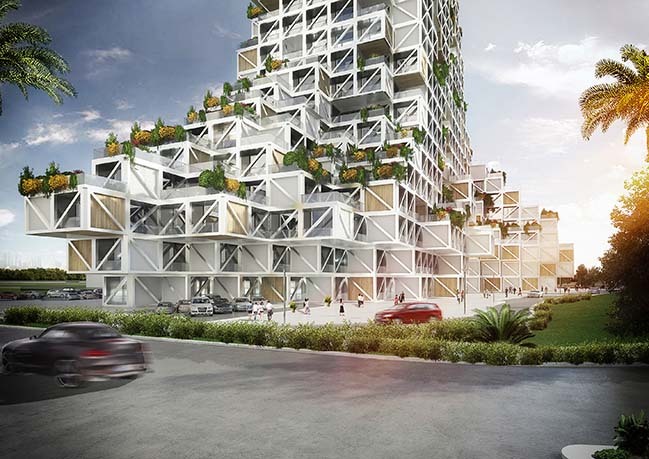 Dubai Nhabitat opens up the urban use by arranging the rear part of the building as walkable as possible, while linking the floor with the intensive transition distribution on the main road. Dubai Nhabitat opens the rear side of the building to urban use with its speciallyarranged landscape design as walkable as possible, while connecting its dense pedestrian network to the main road at the ground level. 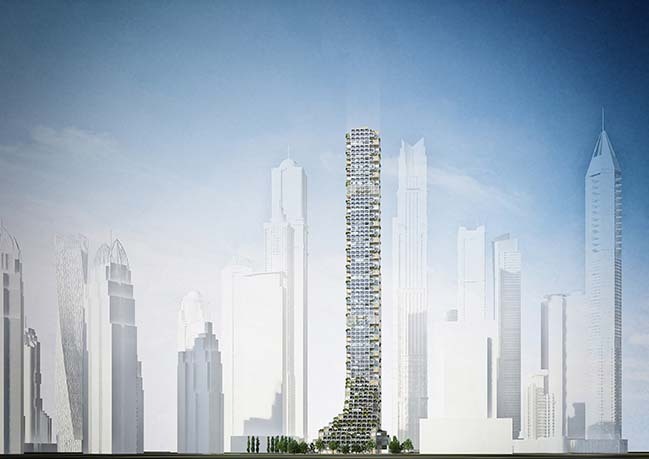 The new tower, designed with a special reference system that denies the fast-growing eclectic architectural language of the region, creates its own micro-climate and vital design inputs through its permeability, different material and building tectonics. 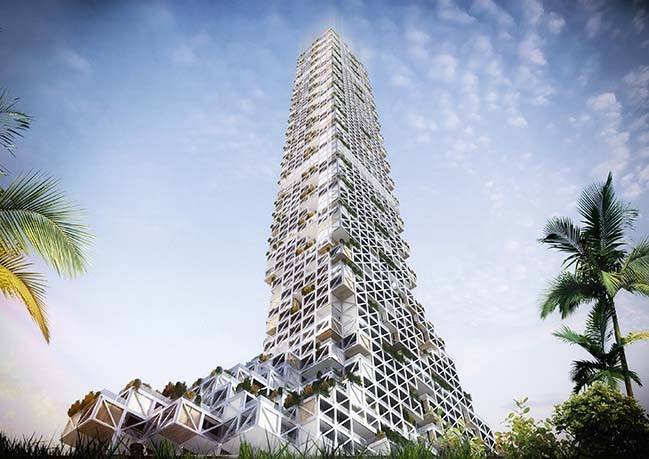 While the tower is being read like a single mass from bottom to top and top to bottom, each module that can be enlarged or shrunk according to the needs of the program creates different vistas with different angles and the private gardens within the modules and the use of outdoor space are balanced together with the building’s intensive form. 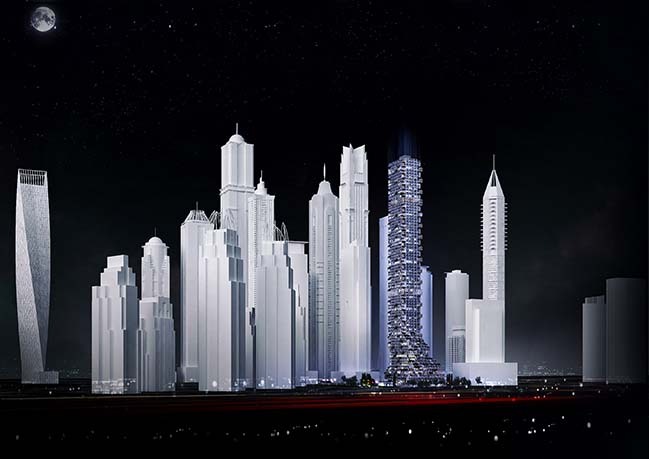 Dubai Nhabitat mixed-use tower, reaching a total of 140,000-square-metre construction area, is comprised of 300 hotel rooms and 450 residential units. 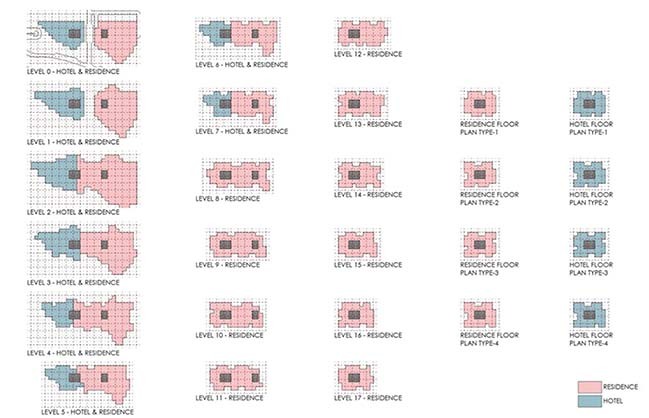 On the ground and on the first floor, the hotel and residence blocks are detached from each other with an urban slit. 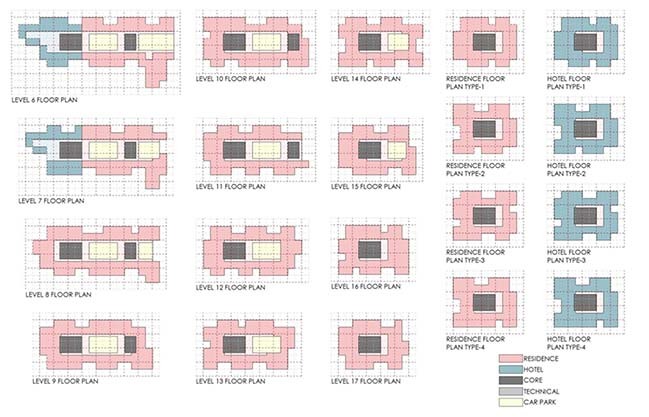 The tower continues with different circulation schemes on the upper floors and the overall density of the mass is diminished by enriching it with the social activity spaces and the viewing terraces in the technical intermediate floors of the general plan. 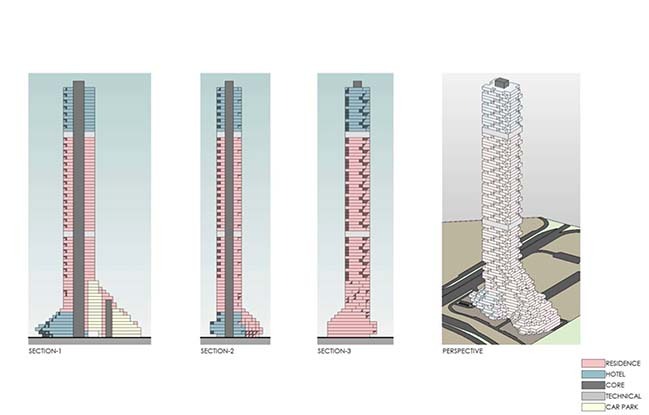 The tower, which continues up to the 12th level with three circulation schemes and continues with two circulation cores after that level, the pedestrian circulation is shortened by carrying some parts of the parking lots to the upper floors in the building. 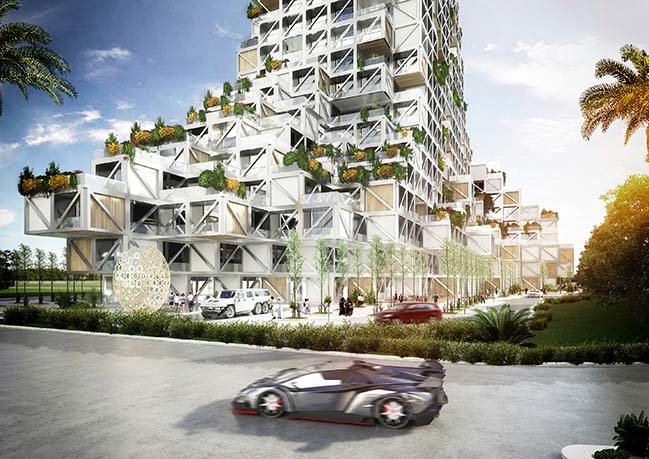 Dubai Nhabitat is planned to be constructed by using an algorithmic software program and to be constructed with a composite system, including steel and concrete. In this sense, Dubai Nhabitat is designed by taking into consideration its carbon footprint on the ground as minimum level as possible, as well as considering Dubai’s local eco-system and reducing the environmental impacts of the construction. 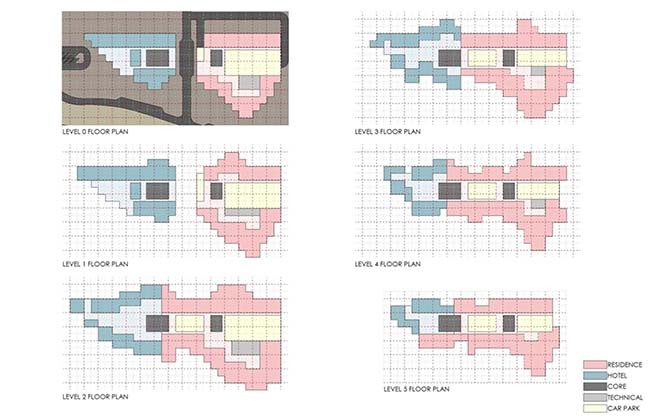 All modules, which can be produced by being enlarged or shrunk by a 8mx8m gridded layout, utilize daylight as much as possible and is defined by windows and partly full surfaces opening through the module to ensure maximum energy efficiency. Dubai Nhabitat, which addresses to monolithic, solid and self-sufficient design principles of existing constructions where are exhibited with their extreme monumentalities, and also highlights their uniform monumental "form-production" mechanism, will be the new landmark of Dubai - which is the biggest city of United Arab Emirates. Dubai Nhabitat will also make an important contribution to the sustainable housing development policies of the region with its utilitarian and outward-oriented architectural language. 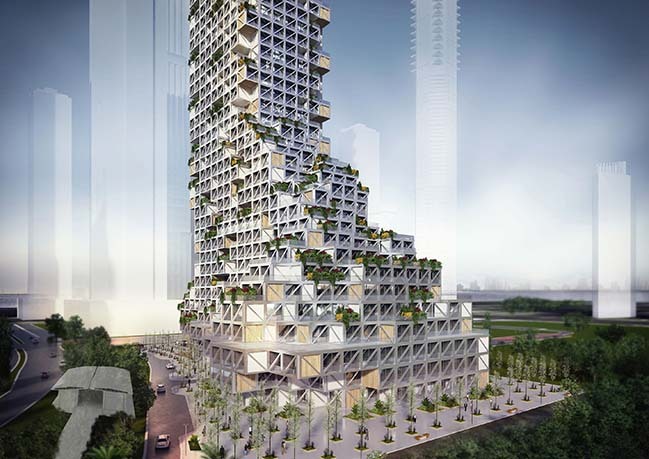 The tower is proposed as a new hybrid housing model that is independent of low-rise island development strategies and the concept of “isolated vertical urbanism”, which allows people the possibility of shaping and managing the natural environment of the people by absorbing the vital elements of the housing concept.